Other Names: None Location: Appomattox County Campaign: Appomattox Campaign (March-April 1865) Date(s): April 8, 1865 Principal Commanders: Maj. 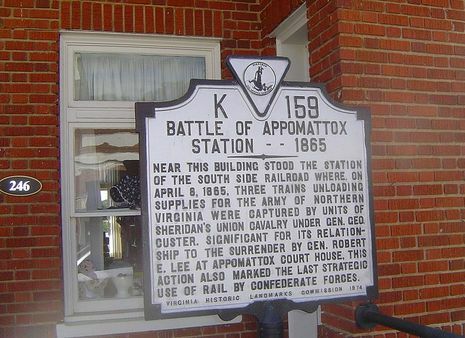 The Battle of Appomattox Station was fought April 8, 1865, during the Appomattox Campaign of the American Civil War. Maj. Gen. George Armstrong Custer's Union cavalry, en route to Appomattox Station, clashed with the reserve artillery of the Confederate Third Corps, Army of Northern Virginia, under Colonel Lindsay Walker. The Union army was ordered to take control of the four supply trains that awaited General Robert E. Lee's Army of Northern Virginia. The trains carried medical supplies, ammunition, and food vital to the under-equipped Confederate army. The Confederate soldiers were vastly outnumbered, and fought to repulse the Union attack. Many of the Confederates were artillerymen and engineers who were acting as infantry, and had little hand to hand battle experience. The Union army was far better trained and much better organized, all of which led to the Confederate defeat. The Confederates failed to hold the oncoming Army of the Potomac back, and as a result, Custer's division captured a supply train and twenty-five guns, driving off and scattering the Confederate defenders. 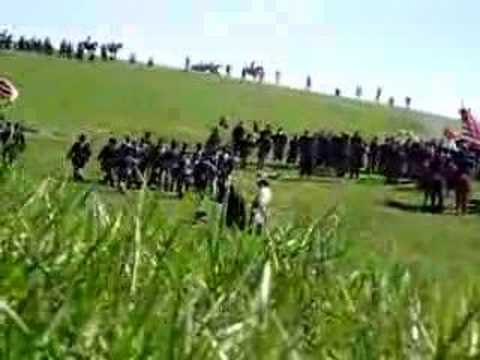 This unique action pitted artillery without infantry support against cavalry. Custer then proceeded to burn three of the captured trains. In late 1864, Gen. William T. Sherman's army began a march with an unknown destination, laying waste to about 20% of the farms in Georgia in his "March to the Sea". Lee's army, thinned by desertion and casualties, was now much smaller than Grant's. Union forces won a decisive victory at the Battle of Five Forks on April 1, 1865, forcing Lee to evacuate Petersburg and Richmond. The Confederate capital fell to the Union XXV Corps, composed of black troops. On the afternoon of April 8, 1865, four supply trains awaited Lee's army at Appomattox Station. The news reached Federal Maj. Gen. George A. Custer and he then pushed his division forward with the 2nd New York Cavalry in the lead. The trains were loaded with supplies—clothes, blankets, equipment, ordnance, medical supplies, and food. After moving along the wagon road beside the railroad, Custer's men approached Appomattox Station from the southeast. The Station consisted of only a few houses with a squad of Confederate cavalry guarding the trains. The Confederates then surrendered to the large Union force. Just as the Union army was preparing to leave in the trains, artillery shells began to fall on their forces. These shells were fired by Confederate Brig. Gen. Rueben Lindsay Walker's Reserve Artillery, which had advanced to the head of Lee's column in order not to impede the movement of the Army of Northern Virginia. With Walker was an approximate force of 100 cannons, 200 baggage wagons, and the army hospital wagons. These forces were unprepared and were not expecting to meet any Union resistance. A fourth train, which had just arrived, started back for Lynchburg in such a rush that it broke some of the couplings and left most of its cars behind. Walker drew his men into a semi-circle and was supported by the only troops in the area, Talcott's Engineers (acting as infantry), Brig. Gen. Martin Gary's Cavalry Brigade, and 75 to 100 artillerymen also acting as infantry. 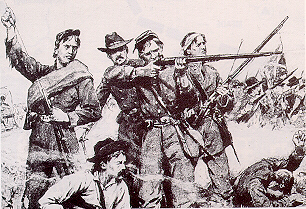 Encounters developed as Federal skirmishers pushed northeast from the Station. The Confederates were hampered by the surprise of the attack, lack of organization, and no central command, which resulted in mass confusion. Custer's men were not sure what lay ahead and were ordered by him to charge, but the advance became disjointed probes and pushes through the unfriendly terrain toward the opposing force. Lee directed Maj. Gen. John Brown Gordon to set up a line to the south of Appomattox Court House and Lt. Gen. James Longstreet to the north of the Confederate bivouac. Gordon was expected to capture Appomattox Station and capture the supplies that had been lost the day before and create a gap in Union lines for the Army of Northern Virginia to break through. Longstreet, providing rear guard cover for the remaining Army of Northern Virginia, would advance in support after Gordon had created the hole in the Union line. With Maj. Gen. Fitzhugh Lee's cavalry on his right, Gordon's men lined up at 2:00 a.m., waiting to attack Maj. Gen. Philip Sheridan's Union cavalry at dawn, shortly before the final advance of the Army of Northern Virginia began. During the night a Union infantry column under Maj. Gen. Edward O. C. Ord began a forced march from Farmville, reaching Appomattox Station just as Gordon's men left their trenches. Directing his men from a knoll at the rear of the formation, Sheridan moved them to appear to be in serious trouble, fortifying their line while they were retreating. The cavalry moving as if to fortify the center line then took a position behind Union infantry lines. Martin's battery fought aggressively on the Confederate left, continuously firing while moving forward. 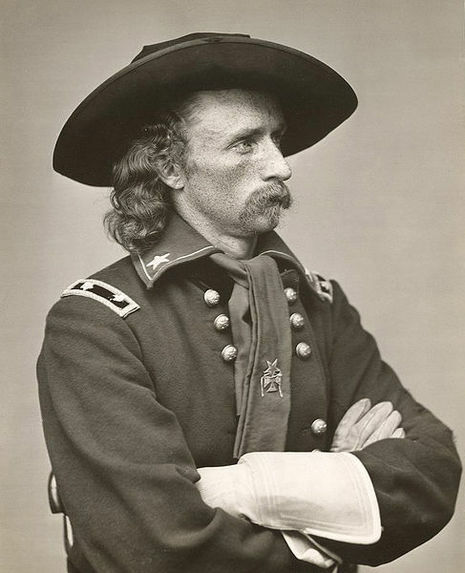 Custer's men made two or three assaults, none very aggressive, as the Union soldiers did not want to get too close to the discharges of canister rounds from the Confederate lines. Meanwhile, the Confederate batteries that were not engaged did their best to escape west towards Lynchburg or north towards Oakville. As darkness was coming on, a final concerted charge was made. Custer's men captured 25 or 30 guns. There are no Confederate casualty reports, so the exact total will never be known—perhaps 100 men killed and wounded in some manner, but nearly 1,000 Confederate soldiers captured, including Brig. Gen. Young Moody, and about 100 wagons. Federal casualties were 48, but Union surgeons commented that they "had never treated so many extreme cases in so short a fight. The wounds were chiefly made by artillery, and were serious; many patients being badly mangled." As the fighting at Appomattox Station subsided, elements of the 15th New York Cavalry, under the direction of Lt. Col. Augustus Root, leapt the fence and gained the Lynchburg-Richmond Stage Road and charged into the village of Appomattox Court House, capturing wagons and teamsters along the way. The New Yorkers retreated back along the stage road, gathering prisoners and shooting mules as they went, thus concluding the engagements on April 8. The Battle of Appomattox Station continued steadily four hours after it had started and lasted until dusk with varying intensity, although more fighting continued in the direction of Appomattox Court House for another five hours. The success of Custer's troopers on the evening of April 8, dispersing and capturing Walker's artillery and securing the Richmond-Lynchburg Stage Road, was vital—the Federals now held the high ground west of Appomattox Court House, squarely across Lee's line of march. With Lee's line of retreat blocked, his only options on April 9, 1865, were to attack or surrender. Lee elected to attack. 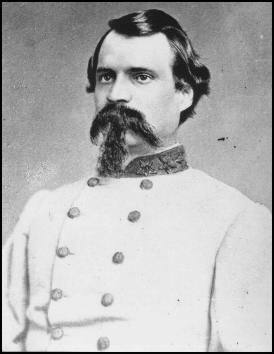 He held a council of war the night of April 8, and determined that an assault would be made to open the road, believing that only Federal cavalry blocked the way. However, during the night parts of three Federal Corps made a forced march and were close at hand to support the Federal cavalry in the morning. The Battle of Appomattox Station on April 8 determined that the surrender would take place on April 9 in the village of Appomattox Court House. The advantage of position gained by the action gave the Federals control of the strategic ground necessary to force Lee's surrender.